In 2015, when I was just starting out my reporting on subsistence food and climate change, I decided to make a trip to Point Hope to attend the whaling feast. I thought I'd set up a place to stay, but then it fell through at the last minute. And I had to get on the plane anyway. And I'll never forget landing, getting out of the plane on a foggy runway, and realizing I had no idea how I was going to get to town from the airport. But soon someone offered me a ride. And then, soon after that, Aanauraq Lane, or "Aana," adopted me and the photographer I was traveling with, found us a place to stay and invited us in to help her make doughnuts. I spent most of the rest of the trip in kitchens, making doughnuts and then helping with akutuq. I learned that one way into the history and culture of a small community is through the kitchen. After that, I started to keep track of the places where I encountered doughnuts as I traveled across the Arctic region. Flour, sugar and oil came to Alaska Native communities with contact. 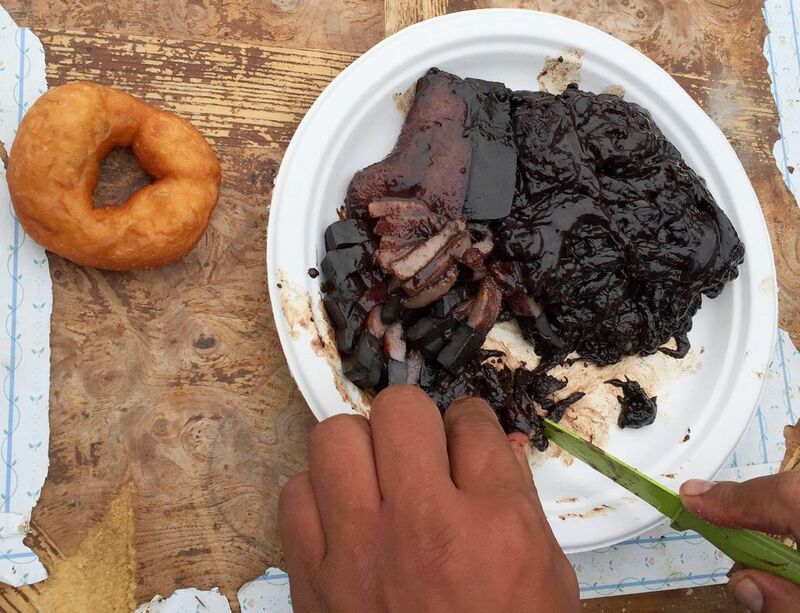 Doughnuts and fry bread were then adopted and adapted as Alaska Native traditional foods. They aren't all that healthy, but they are what celebrations taste like. The smell of them frying takes me back to many a village gym gathering. One of the things I like about the many recipes that I've found in historic cookbooks and been given by readers on Facebook is that they are always for A LOT of doughnuts, like 80 or 100. When you fry, you fry for a crowd. Subsistence, the biggest influencing force in how we all eat up here, is about sharing. There's also some entrepreneurial spirit in there. Doughnut fryers are known to advertise on Facebook when they have a fresh batch. The hardest part about the recipe is getting the frying right. Doughnut-making is so second-nature to the people who write most of the recipes that there is usually no detail about how to fry. For novices, it's made much easier if you use a candy thermometer. If the doughnuts are getting brown on the outside super quickly, like within 20 seconds, your oil is too hot. Alternately, if they don't get pretty close to done on one side after a minute, your oil isn't at temperature. (I burned many in the process of making mine without a thermometer.) Oh, and if you're a newbie, don't forget to put the fan on high and keep a fire extinguisher nearby. Chopsticks, which I first saw being used to fry doughnuts in Adak, are great for fishing them out of the oil. In a large bowl, dissolve salt and sugar in hot water and milk. Sprinkle yeast over the mixture and allow to dissolve. Pour into a standing mixer with a paddle attachment. With mixer at medium speed, add flour slowly and allow to combine until thoroughly mixed. Pour in butter, eggs and lemon zest. Scrape dough out onto a floured surface and knead, adding a little additional flour, until the dough ball is firm and only slightly sticky. Allow it to rise in a warm place for two hours. Once it's risen, gently roll dough on a floured surface and cut into desired shapes. (If you don't have a cutter, use a glass and punch a hole with your finger.) Allow to rise for 20 to 30 minutes. Meanwhile, fill a large Dutch oven or heavy pot about a third of the way with oil. Heat it over medium heat to approximately 365°. (If you don't have a thermometer, you can tell it's ready by throwing a popcorn kernel in. It should pop right away.) Fry the doughnuts roughly 1 to 2 minutes per side, until golden, turning with tongs or chopsticks and then, if desired, immediately roll in cinnamon and sugar. Julia O'Malley, an Anchorage Daily News editor, is working on a book at the Anchorage Museum about how Alaskans eat. Part of the project involves researching, testing and writing "Alaskana recipes" for dishes commonly made in Alaska's kitchens or that use Alaskan ingredients. You can sign up to receive our weekly Alaska food newsletter, "How Alaska eats," in your email inbox by visiting adn.com/newsletter.